It's an exciting day for me as I am here as the Guest Designer for the Deep Ocean Challenge Blog. I have never guested for them before and I am really excited to craft along side their talented design team!! The current theme is "YOUR FAVOURITE COLOUR COMBO". Well this one wasn't hard for me, PINK PINK AND MORE PINK combined with neutrals!! haha!! I was going for a vintage garden feel, so I used a couple of new papers that I actually picked up for my new junk journal hobby (one that I am struggling with). I got the paper packs at Michael's, one is Recollections, the other I'm not familiar with. I decided to try making the flowers out the matching papers and I have to say how much I enjoy the look of the subtle patterns and perfectly corresponding colours. Although this paper was a little flimsy to work with, I stand firm in my determination to use this technique again. Not sure if you can tell in the photo, but the flourish design on the paper actually has a touch of glitter in it. I thought a little bling stick pin would fit this perfectly. The fabulous little green leaf sprigs and the "cherish" sentiment were die cuts that came to me from my good friend Sanderijn of Live, Laugh, Love. I'm not sure what brand they are. If anyone knows, can you let me know in the comments. Spring is really showing it's face here recently and I've not let a day of it go to waste! Of course by the time this goes live, the weather will be freezing cold and they're even calling for snow! I refuse to take down my new patio umbrella darn-it-all!! Just a cool shot, saw rings in my vision for hours after taking this one! DOH! 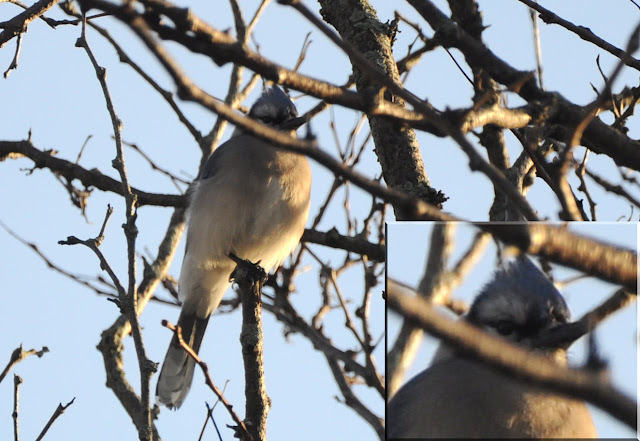 I caught an image of a Blue Jay. He was hiding behind a branch and just wouldn't show his face! I will be entering this image into the fabulous "Our Beautiful World" where the prompt this week is "HIDE". Everybody say Hello to Dee Dee. She is a real cutie, reminds me of Dianna. She's very tiny, just like Dianna, she has the same orange markings, the same round face and even the same shy personality as Dianna. I've been reluctant to name her, but I just can't keep calling her 'hey there'. Here's to a long life Dee Dee! My token coffee shot, looks like the clouds are rolling in already. Hi pamellia. Can not believe I am first it's 8oclock in the evening here. Faboulas colour combo Faboulas card and all your embellishments a Gorgeous. Congrats on your Guest DT post. Love all your pics. Pamellia, you've done it again! I never tire of admiring your creations, you are a master of of grouping together collections of beautiful elements that result in something wonderful to look at! I know there's a real art to it, because I've tried it and mine just look like a random collection of stuff lumped together! Ah well, I'll just keep watching the videos! Fantastic photos too...particularly that 'hiding' Bluejay! Another stunning card Pamellia. Your roses look fabulous made from the matching paper, beautiful details and the little owl is a lovely addition. Sally.x. 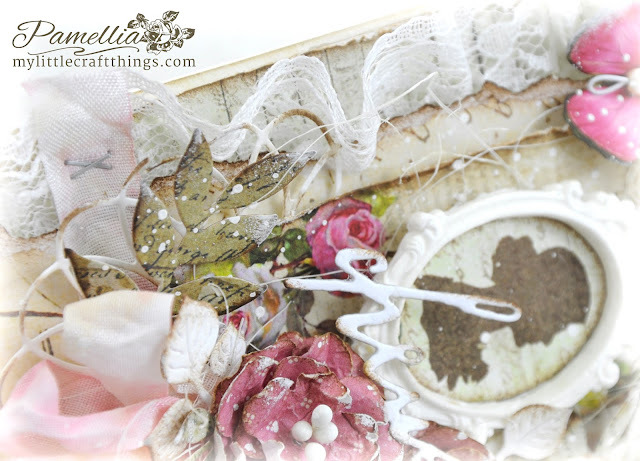 Stunning creation Pamellia, gorgeous papers, colours and layers, love these embellishments and your roses. Congratulations on GD your card is stunning . Love the pinks and those roses are beautiful so much inspiration . Great photos too . Splendid work and remarkable photos indeed. Greetings! Congratulations, your Guest design card is gorgeous and has all your wonderful design details. Super photos and your new furry friend looks a sweetie. Another fabulous card Pamellia! Funny, I never had you picked out as a pink girl,, more blue or green.... Anyway, congrats on your GDT spot, they are lucky to have you guesting for them! Gorgeous card Pamellia and I think the sentiment die cut is a TH hand written word die. Great pics and Dee Dee is so sweet. 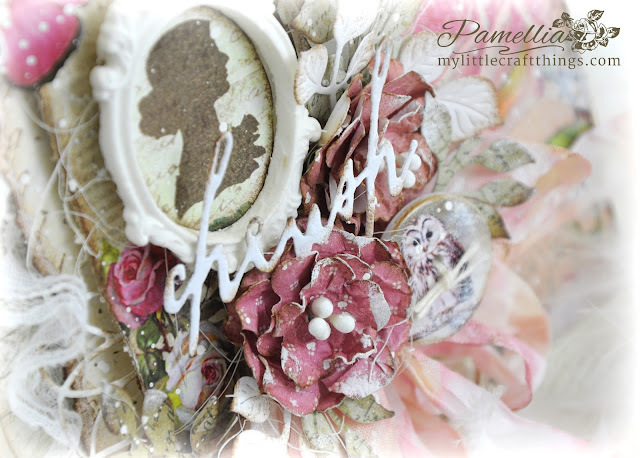 Beautiful card, Pamellia! So happy you have a new friend coming to visit. Lovely photos. Im happy for your new friend! Holy smokes girl, you nailed it! Congrats on your GD spot~you are so deserving! I love the subtle papers and fabulous color combination~of course pink is one of my favorite colors as well! The details are amazing as always~so stunning Pamellia! Aaaw, Dee Dee is so sweet and enjoy all the pictures you take and share! Where in Canada do you live? We go fishing every year to Ontario for a week and LOVE it there! Thanks Sherrie. We live in the South West Region near Streetsville. Where do you fish? Wonderful creation once again Pamellia - I too was wanting to know where that cherish die came from, as I got it as a freebie too. Love your photos, as ever. I vicariously travel the world through other peoples photographs. Dee Dee looks gorgeous - here's to a long life for her. Another absolute stunner Pamelia...love the colors on this one..subtle yet bright!! Gorgeous card Pamellia and such wonderful photos! Love all the layers and dimension! Congrats on your position! So well deserved! 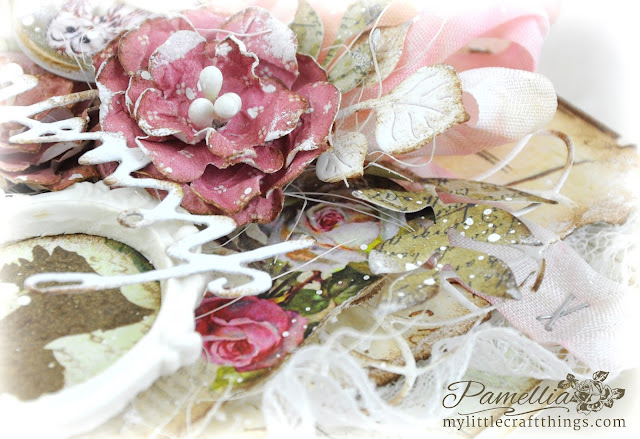 Another of your beautifully layered creations Pamellia, gorgeous colours and elements combined to achieve stunning effects, you have a wonderful natural talent for creating these designs. Love the photos of your countryside and of Dee-Dee. 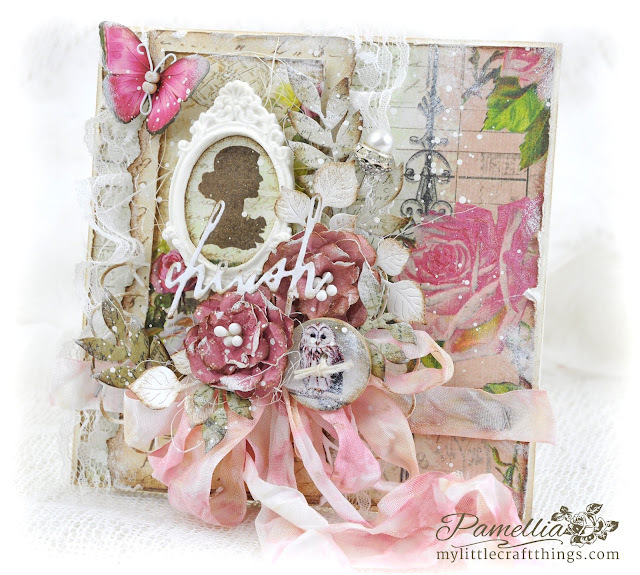 Beautiful card Pamellia and the colour combo is really great! Hugs! Congrats on your GDT spot, my dear! Your pink and neutrals card is exquisite and so feminine with that awesome framed silhouette and a stunning flower arrangement! I absolutely love it! Great photos, too, as always! What a wonderful springtime! I run out of ohs and ahs whenever I visit, this is another stunner Pamellia, so very beautiful with your perfection on details. Love the owl and the wire through the butterfly is wonderful. I can't say enough about it, so will finish with admiring your area and animals in your photographs. Well this is simply breathtaking make Pamellia! 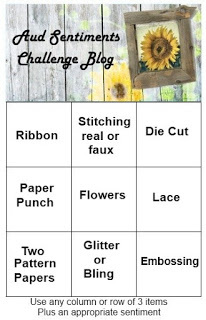 Love the shabby bow!!! 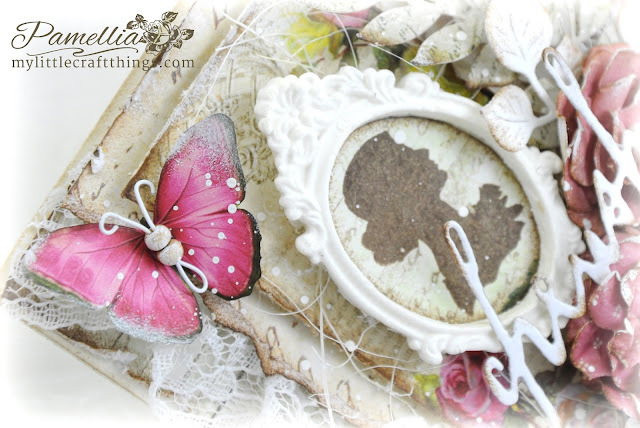 The cameo looks great in the fancy frame and the floral arrangement is beautifully done! Gorgeous photos and utterly gorgeous project...oh the layers! Love all the little nods to nature on this beauty...the owl...the butterfly and all the amazing flowers! 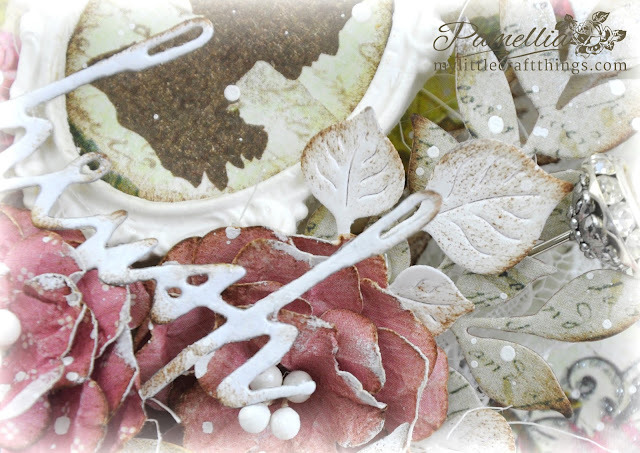 And then there's that classic touch with the cameo...simply amazing design, Pamellia! Hugs! Another beautiful card with such a lovely romantic feel to it. Congratulations on your GDT, you certainly made a beautiful card for them, the papers are gorgeous and I love your flowers - delicate and beautiful. I see that someone else has already said, the 'cherish' is a Tim die, from the Handwritten Love set. Your lady has pearls, diamonds, lace, ribbon, flowers, butterflies and her own person snowy owl.... how lucky is she!!!????????? This is lovely Pamellia. Reminds me of a Victorian movie where everything was so elegant and ritzy. Really lovely roses - both on the paper and the ones you created. I am soooooooooooooooooo excited to see DeeDee. Yes - I am claiming a Bible promise for her.... with long (animal) life will God satisfy you and show you His salvation!!!!!!!! She is lovely and yes - so looks like Dianna. Maybe they were sisters! Heheheh so true - you birdie is definitely hiding!!! Love that picture - you are really so great with your camera girl. I so enjoy your artwork but your posts are even more fabulous with the wondrous photos!!!! Happy Easter! XXj. Love this! So pretty! I love your lovely photos too, thanks for sharing with us at Our Beautiful World! 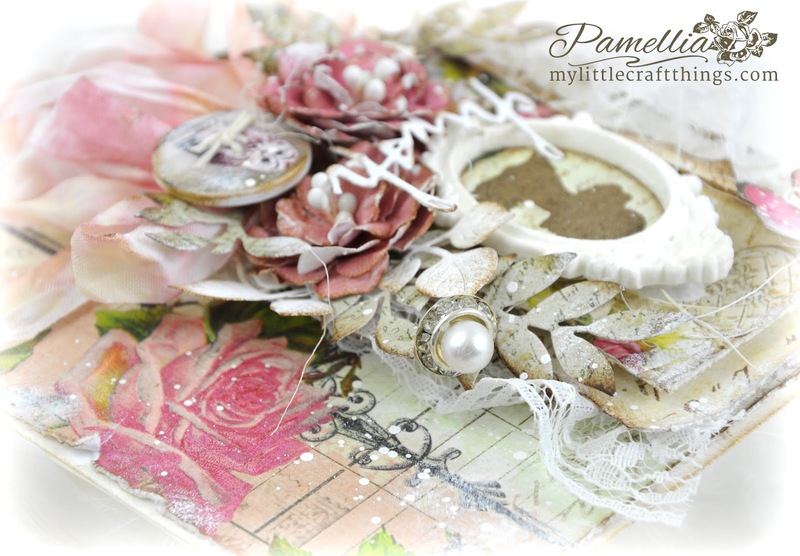 Beautiful photos and card, Pamellia, and congrats on the GDT place! Dee Dee is such a cutie... Thank you for joining us at Our Beautiful World! Congrats on your GD spot and your card is beautiful!! You know I love your photos ... they transport me to another place ... Thanks so much for sharing with us at OBW! Got to be brief, because I'm headed off to work, but had to tell you how wonderful your card is,and I hope you will put my name on it! Lovely! Did I say quick? My computer is eating my comment faster than I can write it! LOVE, LOVE, LOVE this work of art, and I'll be back to drool over it some more! Congrats on your GDT spot; they are so very fortunate to have you! As you already know TH is the maker of the cherish die; don't know the other. 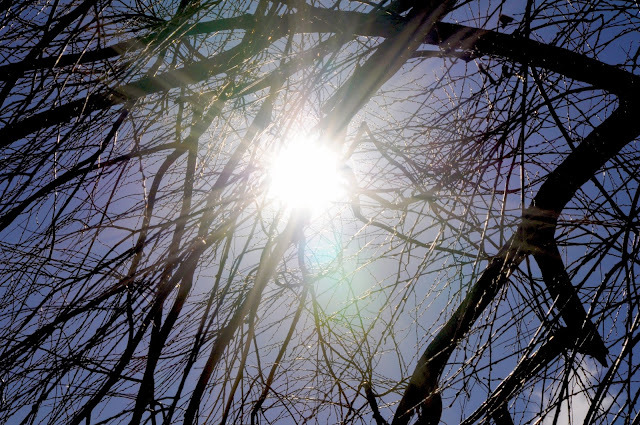 Sending more sunshine and lots of hugs! A pinky vision of sheer loveliness. All soft and floaty. Aww, so glad you have a new friend visiting. Hope all the usual suspects are coming for a feed. Stunning creation Pamellia! I love the gorgeous papers and your beautiful flowers! Fantastic photos too! Lovely photos!Thanks for sharing with us in Our Beautiful World!Happy Easter!AriadnefromGreece! Fabulous card Pamellia, lots of lovely colours and pretty flowers. The flamboyant bow almost has a personality of its own and the butterfly really pops off the card - it is so pretty. There is so much to see and I spot something different every time I look. We had one day of spring last week but winter is back with a vengeance today! Dee Dee is very sweet and looks very young but surely she could not be from an early litter? Absolutely stunning, I just love all the details. Thanks for playing along with us at Southern Girls. Wow this is just stunning. 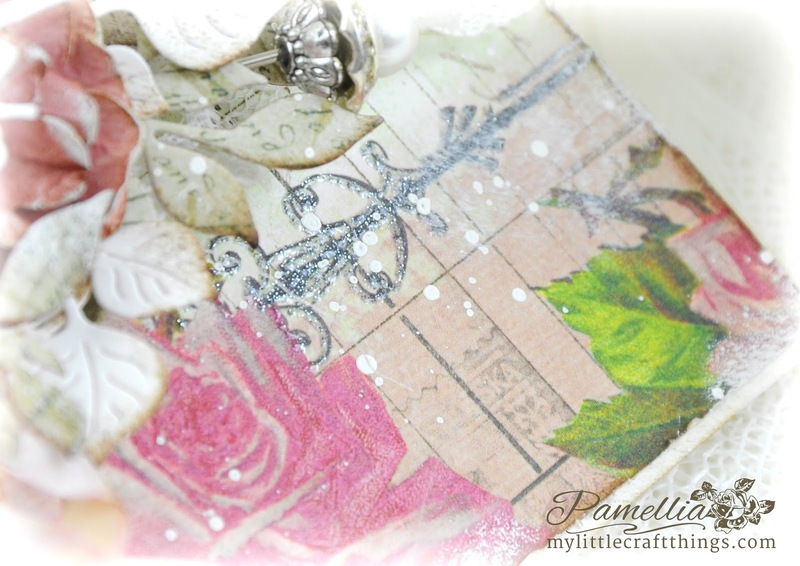 Love all the pretty embellishments and beautiful die cuts you used. Thanks for joining in the In The Pink challenge this time. Hope to see you again. 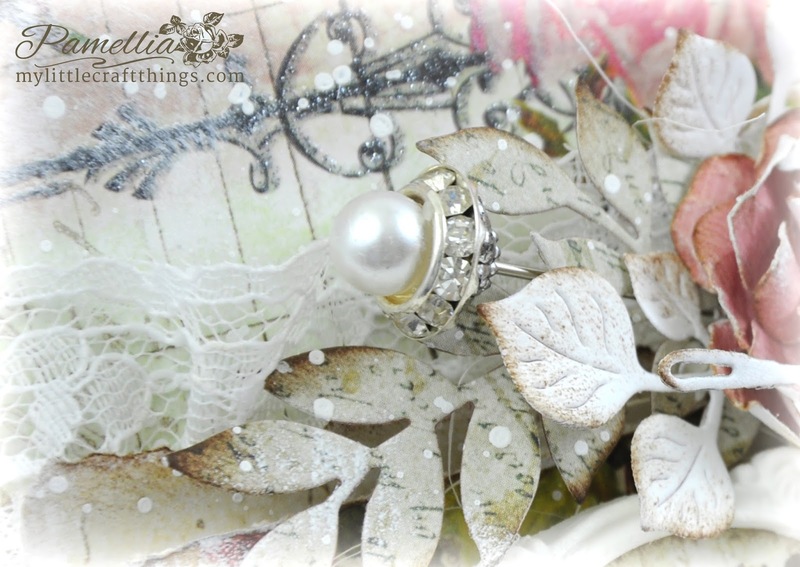 Shabby chic at its finest--just wow! Thanks for sharing!